Portland had a big geek gathering this past weekend and, wouldn't you know it, many most excellent cosplayers were out in force at the Rose City Comic-Con. 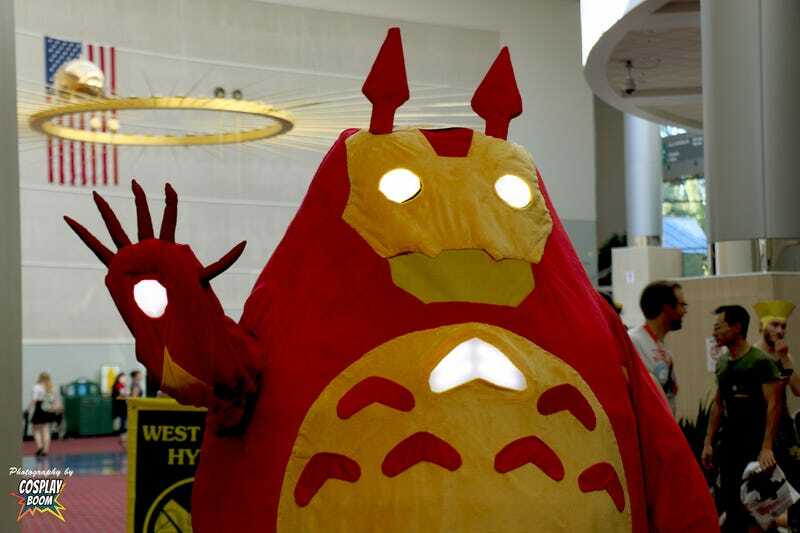 Here's Iron Totoro or, as I like to call him, My Neighbor Tony Stark. Come on through for more costuming that runs the gamut from cute to creepy. Sure, you'll see a bunch of people done up as familiar Marvel characters in the photos below. But you'll also get a look at some great Fire Emblem, Corpse Bride and Skyrim cosplay, too. These pics come from documentary series/social network Cosplay Boom and all photos and stills were taken by Todd Kenreck and Meagan Sadler. The first episode of the Cosplay Boom docu-series premieres on September 30th. If you like fancy-pants genre-based dress-up, then you know what to do. Carmen Melendez and Ben Misenar as The Monarch & Dr. Girlfriend from The Venture Bros.